Proper mowing is a very important practice to keep the lawn healthy and good-looking. A great choice of lawn mower is Bosch Rotak 34 rotary mower because it is very easy to charge and therefore can be used quickly and easily. It will only take you an hour to fully charge the battery or if you are in a hurry, it will only take you 30 minutes to have it 80% charged. Being cordless, this mower has no chance at all of accidentally cutting the cord or damaging the plants when the cord is moved. Your lawn grass is the same as most plants. If you cut the growing points (in the case of the grass, it is the crown), the plants will branch out and get denser. One small grass area will eventually turn into a firmly woven lawn. If you do not mow at all, the outdoor yard will turn into a prairie rather than a lawn. The simple act of mowing is not what makes the lawn look good. 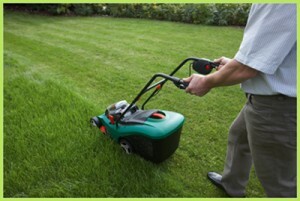 The health and beauty of the lawn is determined by how often you mow the lawn and what height you maintain your grass. There are recommended mowing heights for many kinds of grasses. Keep your grass at the upper end of the recommended range especially when the grass is going through stressful conditions. These bad times for grasses happen on hot weathers and drought. In cooler weathers, you can trim the grass lower. It is highly suggested that the one-third rule be followed for a flourishing lawn. It means that you should not cut more than a third of the blade of the grass for each mowing. Edging and trimming the grasses can be considered as the finishing touches. There are tools called edgers which you can use to trim your lawn. They cut nicely but may leave some grass debris and dirt which you must not forget to clean up. You can use trimmers along hard surfaces or in tight spaces but they also leave behind some clippings which you must sweep up. Always keep your lawn and outdoor surroundings clean. If your mowing does not remove more than a third of the blade, do not throw the clippings on the dump because they can be made organic fertilizers and be left on the lawn. These small clippings will quickly break down and the amount of other fertilizers that you need to use on the lawn can decrease for a high as 25%. It has also been proven by research that grass clippings do not cause building up of thatch. These are only some of the methods used in mowing the lawn. Do these methods with the use of Bosch Rotak 34 Lawn Mower to get effective results.